My Project Spectrum this month is knitting, though you might say the Halloween quilt is neutral too. 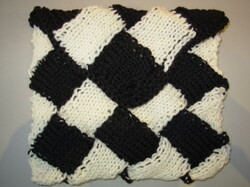 After I finished the entrelac bag and scarf I got all excited about designing some entrelac patterns. 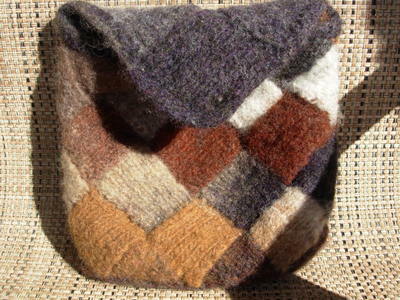 So I started with a small knitted and felted pouch (sort of the size and shape of an evening bag). 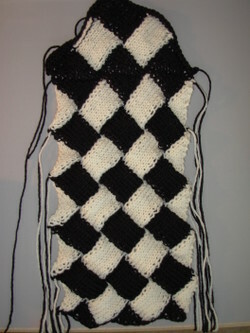 It was made with black and white Cascade 220 and I knit it flat just because I wanted to try it both ways. 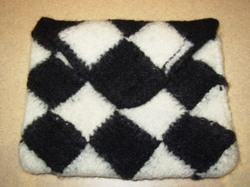 The first three photos are before felting, the last one is after felting. I'm not terribly pleased with the results, partially because the black and white don't felt together so well. I'm used to doing this with something like Kureyon where the colors blend nicely. With the black and white there are black fuzzies on the white that I can't seem to get off. 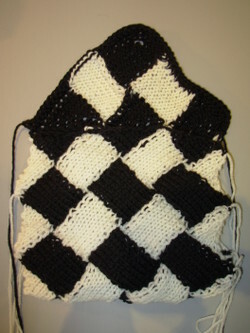 Anyway, I decided I really don't like entrelac knitted flat. So I made another one. This time with a neutral colorway of Kureyon and knitted in the round and I like this one much better! I still might make some changes to the pattern, but I really like it. It needs a button and perhaps a handle. 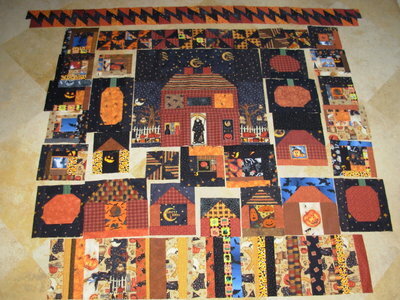 Now, I thought I'd show the parts for the Halloween quilt. This is not necessarily the layout I will use, but you can see the pieces this way. I got a question about the size of the witch's house. It's 20 inches tall by 21 inches wide. Well, tomorrow is the big day. The kids and I leave for a 5 week tour of California and New Mexico. It's going to be a lot of fun and wonderful to see friends and family. Yesterday I took another trek with my dad, so there will be photos of that coming up. You should see the bin of knitting I'm taking along. Maybe I'll get a photo for you because there will surely be knitting on this trip, though probably less than I'm planning for! I'll be posting on the road when I get a chance.